con lluvia Y asi, una maravilla! 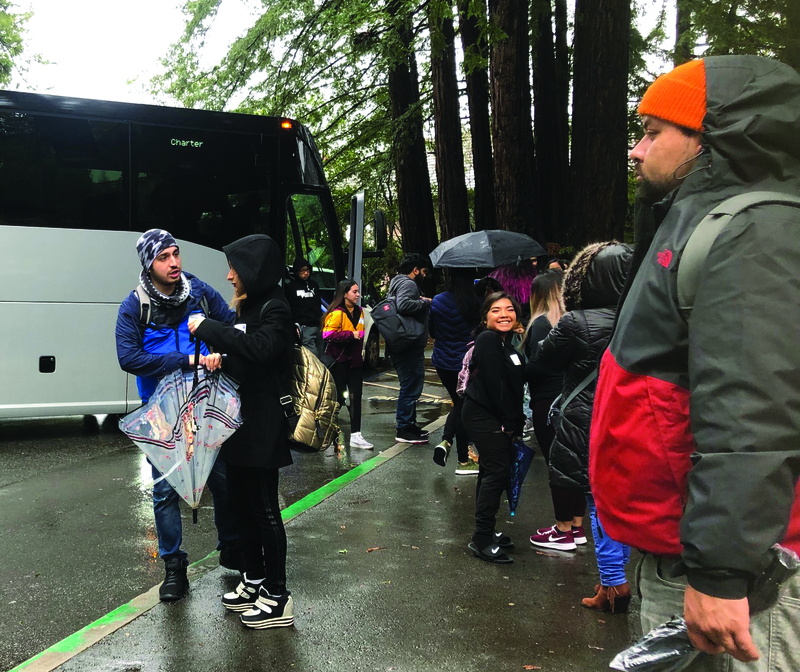 SJCC students excitedly arrive to UC Santa Cruz on the rainy morning of March 2, for Family Day 2019. Questions of whether the nature walk would take place started to be heard as early as 7:20 on the rainy morning of Saturday, March 2, as breakfast was being served in the METAS Center, M-104. SJCC students and their guests had various reasons for gathering to attend Dia de la Familia / Family Day 2019 at UCSC. 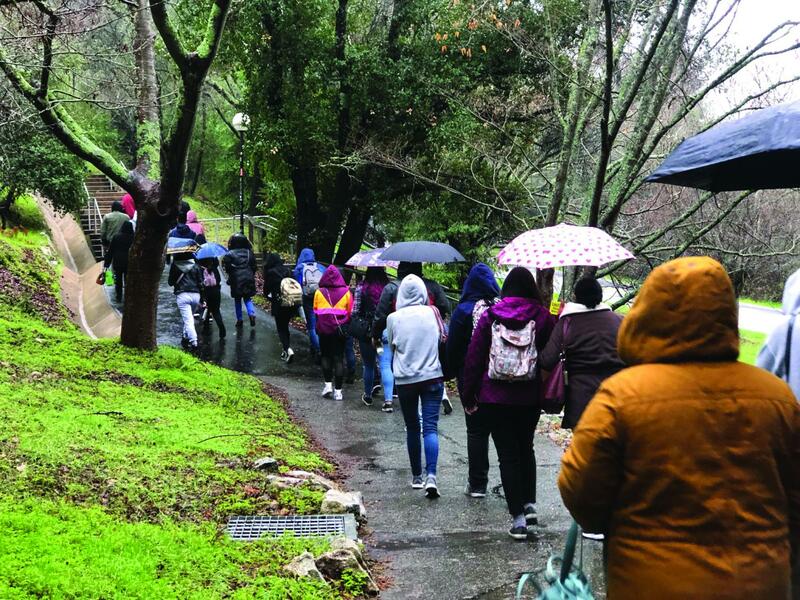 The event hosted by SJCC and UCSC features a popular Nature/Campus Walk at the end—weather permitting. “It was a once in a lifetime opportunity,” said Nicole Barajas, 19, Biology major at SJCC of attending the event with her boyfriend, Levy Torres, 19. Participation in Family Day covers transportation to and from the university as well as breakfast and lunch with raffle prizes. The biggest reward being the shared experience of students along with their parents actualizing how realistic it is to pay for, attend and walk the campus of a prestigious university located right over the hill with plenty of options for financial help. 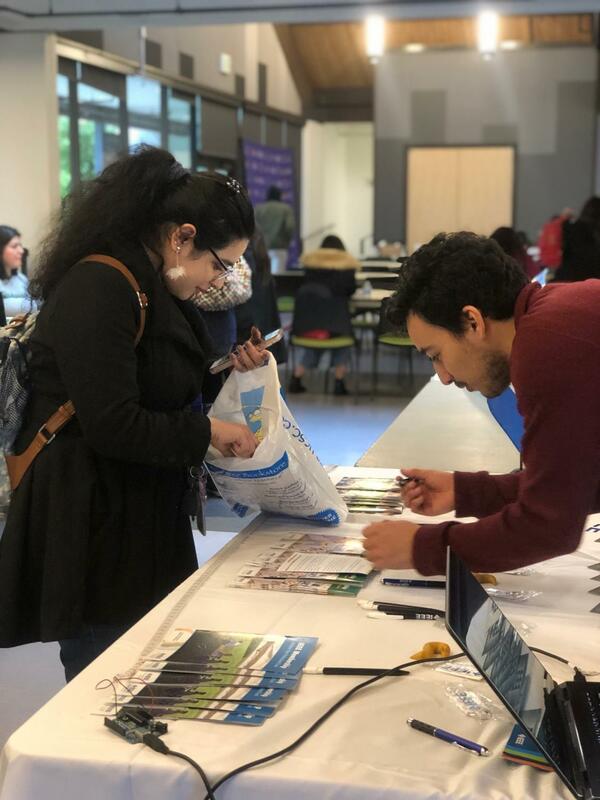 Even greater was the abundance of Spanish speakers which made the event and the sessions that much more valuable for the families participating because the information and everything being explained was made understandable to many who are 1st generation college families. “I do feel comfortable now that I was told about the many more resources for financial aid available at UCSC in addition to those at SJCC for my daughter to take advantage of,” says Berenice Melchor, 39, mother. Two break-out sessions were split up by burritos for lunch, and there were booths set up from a few of the university’s organizations and programs ready with flyers, pamphlets, samples of their works, stickers and treats. One booth, UCSC Women’s Center, even had a custom lip balm and of course, all handed out tickets for the raffle drawing. The sessions were held in classrooms on the university campus. Luis Vargas and Hugo Maldonado of UCSC Financial Aid Office hosted Paying for College, covering the Blue and Gold Opportunity Plan and step-by-step guidance about financial aid. UCSC Undocumented Student Services’ Anakaren Quintero and Luis Mendel covered a special session with an emphasis on transferring to a UC under the California Dream Act, and the financial aid available to undocumented students and to those who qualify for nonresident tuition exemption under AB 540. Monica Galvan of UCSC Transfer Preparation Program & Services for Transfer and Re-Entry Students along with peer mentors of the university spoke about the Transfer Admission Guarantee, Transfer Preparation Program services and the support provided by the STARS program at UCSC throughout the transfer journey. “I learned more about STARS, I had kinda heard about it but I didn’t really know what it is, so it was helpful to learn all about that today,” says Berenice Melchor, 18, psychology, whose family sacrificed a trip to the snow in order to attend the event. The rain let up enough to allow for the nature walk, for those that wanted to go, done in groups. The walk’s guide highlighted the beauty of the campus with helpful locations: campus store, cafes, important offices and the best spots to nap. Banana slugs were spotted and some walked past Angela Davis’ Honorary Office. “I learned a lot, I’ll use the information for sure,” Torres, 19, boyfriend and Barajas’ guest confirmed he felt inspired by the event, hinting at a return to college. Barajas and Melchor already knew about some of the services but wanted to learn more and show their guests the many more ways it is possible through financial aid and services to attend a UC. From the start to the end, rainy or cloudy, Dia de la Familia / Family Day 2019 is a wonder, una maravilla!